Back in the 80s and 90s whilst I was growing up in KL, Nyonya restaurants were few and far between. Unless you were lucky enough to grow up in a Nyonya household and have it home-cooked as I did, decent Nyonya food was scarce in the capital. The only restaurants worth noting tended to be based in the Straits-Chinese strongholds of Penang in Northern Malaysia and Malacca to the south. Also known as Peranakan or Baba-Nyonya food, this subset of Malaysian cuisine came about in the 15th and 16th centuries. At the time, the rise of the Indo-China spice trade brought with it a wave of Southern Chinese immigrants into Malaya. As these immigrants integrated into society and married into local Malay families, a new breed of food emerged over time which combined their Chinese food heritage with the use of local Malay ingredients. In recent years however, the KL restaurant scene has seen somewhat of a revival in Nyonya food. Much of this is thanks to the legend that is Uncle John, a true Baba who is bringing this heritage cuisine back into fashion in the capital. I first tasted Uncle John’s food back when he was the chef at Jalan Mesui’s Limablas in 2013. Since then, Uncle John and restaurateur Alan Yun have split off from their former business partners at Limablas, moving to new premises at 50 Jalan Doraisamy under their new brand, Limapulo: Baba can cook. The brand may be new, but Uncle John’s Malacca-style Nyonya food is still going as strong as ever at Limapulo. Their new home, sited on what was formerly the Asian Heritage row is more modern-KL-shoplot than old Malacca shophouse. However, the distressed chairs and retro ornaments of its interior ranging from vintage telephones to old meat grinders are a throwback to the Peranakan era of yesteryear. Their signature Nyonya Laksa Lemak, recently voted the Best Curry Laksa in the Klang Valley by The Star People’s Food Awards is fully deserving of its crown. 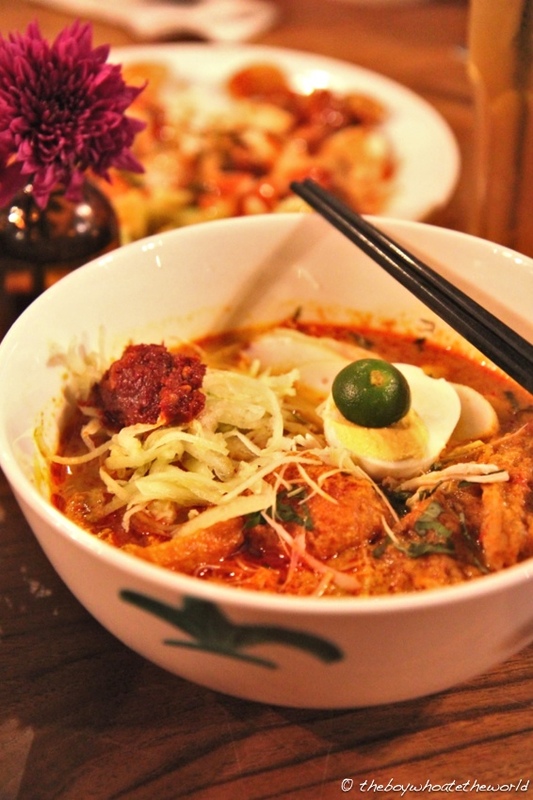 The broth is incredibly balanced, delivering layer after layer of complex Nyonya spices. There’s just the right amount of coconut milk – enough to give it creamy body without it becoming overly rich. A quenelle of sambal belacan, served separately on top of each bowl allows diners to customise their own heat level. Best of all, it’s a mere RM9.90 a bowl – an absolute steal considering how fully loaded it is with poached chicken, fish balls and deep-fried tofu. I hear Uncle John & team only make enough Laksa paste for 70 bowls a day across their Limapulo and Limabelas @ The Intermark franchises, so call ahead to save a bowl or get there early for lunch before they sell out. For those who don’t fancy Laksa, there’s a slew of other Nyonya favourites on offer. For starters, there’s crispy Kuih Pie Tee (Top Hats), filled with yam bean, carrots and shrimp. Their sweet and savoury Ayam Pongteh (Chicken, Fermented Soya Bean and Potato Stew), an age-old Malaccan dish was Nyonya comfort food at its absolute best. Ayam Rempah, a fragrant chicken dish with Nyonya spices and coconut milk was moreish and tasty with a fabulous kick of chilli. If there’s one dish I can’t resist everytime I visit, it would have to be their Sambal Sotong Petai (spicy ‘stink’ beans with squid) which continues to reign supreme. The distinct flavour and pungent smell of petai isn’t for the faint-hearted. However, when it is paired with a killer sambal like they do here, it’s a match made in Nyonya heaven. With Uncle John leading the charge and mentoring a new generation of cooks at Limapulo, it would appear that Nyonya cuisine is in good hands in the capital. Long may KL’s Nyonya food legacy live on. I for one will continue to do my Baba best to keep the legacy alive in London at my Nyonya Supper Club. As an Aussie, I often travel to KL, and when I do I shy away from Baba Nyonya food as my taste buds tend to explode in my mouth and my soft pallet can’t handle it. But Laksa is one of my fav’s. Can’t wait to try the one you have just pointed out, (with no chilli chosen), as well as a new eatery set up by a couple of chefs well known on the seen. The cafe is called #HELLO, and it will be my first step after the one into the terminal and out of the cab. Hope you have a chance to get there and write something about it. Chef Johnny has cooked from me before in #Tanzini, and now I can’t wait to go ‘home-cooked’ at #HELLO. @Justin: The separate serving of sambal on the side here at Limapulo does allow you to customise the heat levels somewhat! Thanks for the recommendation re Hello, will look it up next time I’m back in KL.